Medium duty racks combine solid load capacity with easy-to-use button-on cantilever arms for some of the easiest rack to buy, install and use on the market. 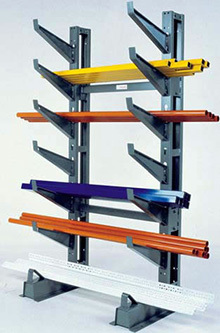 With straight or inclined arms, these racks are ideal for pipe, tubing, lumber and bar stock. Just "button" arms into position -- no nuts or bolts are required.